This postcard shows a number of large vessels by the Parapet Wall, as well as some naval ships anchored in the firth. Thanks to Mike Day for supplying us with an improved scan of this postcard. I have a feeling this could be later than 1902. Ship with smoke coming from funnel at left and steaming left, with dark band around white hull appears to be RFA Maine, fleet hospital ship. She is seen in other PCs of Fleet after manoeuvers, at anchor in Cromarty. I am checking her dates but RFA was founded in 1905. Although the Maine was not classified as an RFA until 1905, she was operated as a Hospital Ship by the Army from 1900 and the Admiralty from 1901. That is very true about the RFA Maine, however the ship behind the stern of the Admiralty yacht Enchantress, commissioned in 1903, is HMS Dreadnought, commissioned in 1906. The ships at anchor, mid-picture behind the mast of the middle fishing boat and the schooner are also Dreadnoughts of the Bellerophon and St Vincent class so the photo is in fact 1909/1910. I have a scan of the better photo which I can send in. 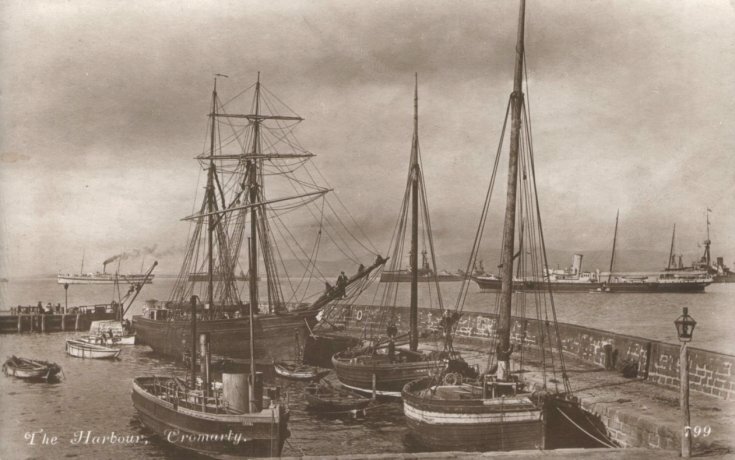 The Schooner in the harbour is the Bonnie Lass which was wrecked in February 1906. So 1906 is the latest date possible.